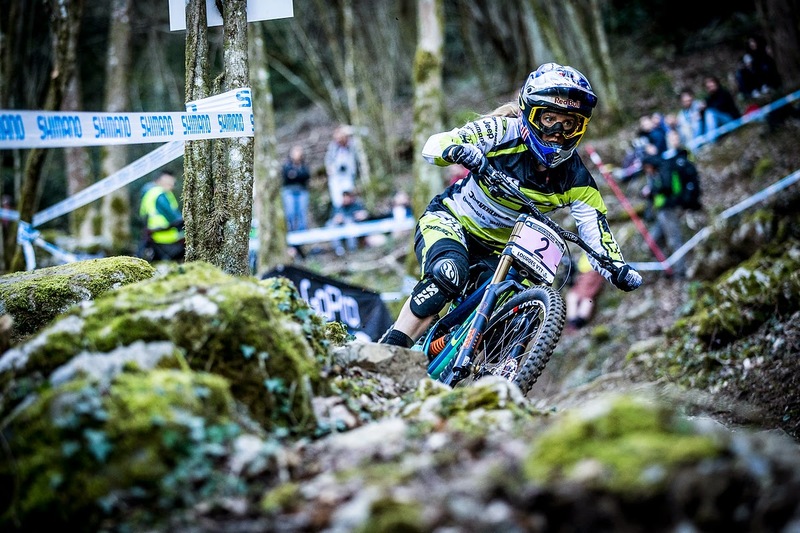 Race Report: UCI World Cup Round 1 presented by Shimano in Lourdes, France, 12th April 2015. It was a mixed start to the season for a battered and bruised GT Factory Racing team - 2nd place for Rachel and a solid 30th for Taylor in his first Elite race even with a broken thumb. But then a massive crash in qualifying almost put Gee out of action. 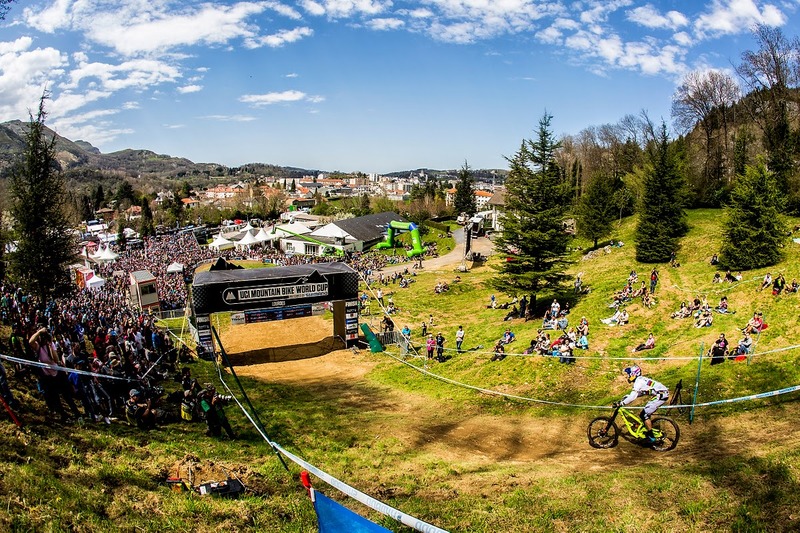 The brutal Lourdes track was running fast and really rough as the women's race got underway in front of a noisy and appreciative crowd. Far from the predicted torrents and mud, the rains had pretty much stayed away although there was some drizzle after Saturday's qualifying and some showers overnight. As the women took to the track, it was dry, dusty and loose. Manon Carpenter had qualified 5th and was in the hot-seat with a time of 3.40.53 as the 4th-fastest qualifier Emmeline Ragot started her Finals run. And what a huge run it was! With her trademark bravery, Ragot rode the entire course right on the edge of control. Seconds out of the start-gate, the riders face a massive rock garden; Emmeline positively flew through this with no holding back to go over 6 seconds up at the first split. She kept this blistering pace right down to the bottom, smashing Manon's run by nearly 8 seconds to take the lead. Next up was Myriam Nicole, notoriously dangerous on steep tracks such as this. Nicknamed Pompon, Myriam was on fire, going ahead at split 1, but in the end she couldn't match Emmeline and went into second by 2.5 seconds. Rachel was up next. Coming out of the start-gate 100% committed, Rachel charged through the rock garden with her technical skills to the fore to go first as split 1! She kept up the pace through the woods, clearly relishing the steep and challenging track to maintain that lead at split 2. But shortly after the split she stalled going into a vital right-hand corner, a relatively small mistake that had a significant effect on her momentum. She couldn't seem to regain her former speed in the bottom section and crossed the line in second, 2 seconds back on Ragot. Tracey Hannah was still on course. She was 2nd to Rach at split 1 and 3rd at split 2 but she took a tumble on the bottom section, crossing the line in 5th. Rachel said: "I'm happy, I loved the track and the crowd were totally wild. Well done to Ragot who was on fire today and massive respect to Gee-man!" In the men's race, both GT Factory Racing riders were riding with broken bones. Taylor Vernon had broken his thumb during training in New Zealand and was riding in heavy strapping. He rode a solid race but lost valuable time to finish 30th today with a small mistake in the bottom section, a very encouraging start to his first Elite season under the circumstances. Taylor said: "This weekend was good fun! The track was brutal, not what my thumb wanted but i managed to crack on. I was feeling good during my race until a mistake took me off the track at the bottom, losing a bit of time putting me back to 30th. All in all, a great experience at my first Elite race. Time to get healed up - bring on round 2." Only Gee's legendary toughness could have got him to the start-gate this afternoon after a front tyre washout in the woods section in yesterday's qualis left him with a hand injury, that potentially looks to be a break*. 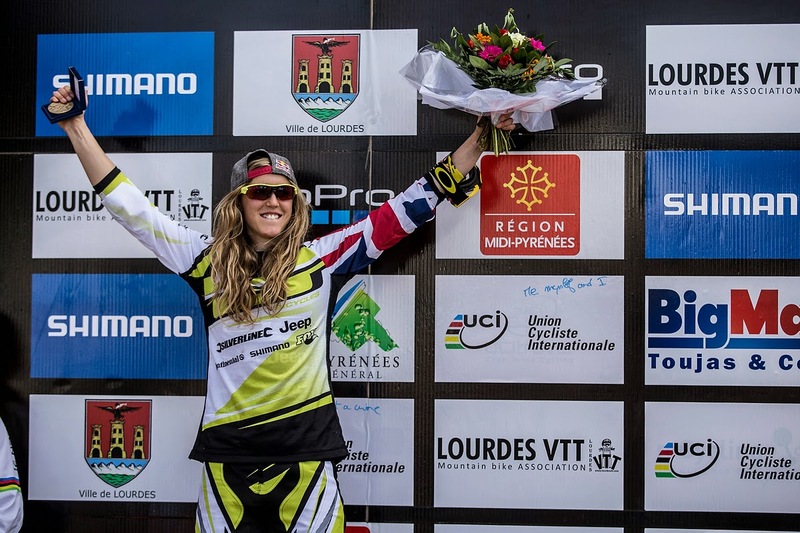 It was strategically important that he rode to secure his place in a 90-minute timed training session in Fort William so the team attached a stopwatch to the bars of his bike and sent him out to roll down the course, heavily strapped and in a lot of pain. To secure his place Gee had to finish within 100% of the winning time - today just under 6 minutes. But as soon as he left the gates Gee's racing instincts kicked in and he rode the course just 16 seconds slower than the eventual winner Aaron Gwin, 48th place on the day! Gee said: "That's Round 1 done! I'm happy with the result today considering the broken wrist. 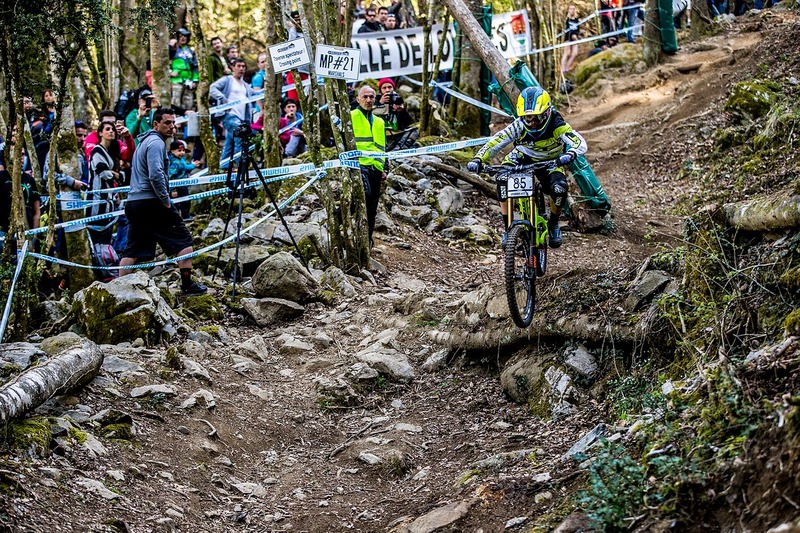 Always nerve-wracking to ride with your hand strapped to the bars - especially racing at a track like Lourdes!" Gwin had been another casualty of qualis (DSQ after a big crash) and so he was another rider to drop in for his race run much earlier in the running than usual. It seemed that he must have got off lightly though as he put in an absolutely scorching run to take the hot-seat in 2.58 - the only sub 3-minute run of the finals and 4 seconds clear of the rest of the field. Mike Jones grabbed his first World Cup podium, crossing the line in 2nd (an eventual 3rd place result), but Neko Mulally was gutted with a broken wheel just a few seconds out of the gate. Then only Bryceland, Thirion and Loic Bruni were left on the hill. Josh couldn't get close, Remi Thirion flatted in the bottom section so it was all down to Loic, the last rider down. He almost lost control in the first corner but recovered enough for a fantastic run, going into 2nd place. Team Director Dan Brown said: "I'm proud of the team this weekend, Taylor rode well and there is obviously a lot of potential there. Rachel is fired up for a challenging season and Gee, well, when the going gets tough...!" * Tbc on return to the UK.